When it was first announced that Rogue One: A Star Wars Story would be taking place in the same time period as the animated series Star Wars Rebels, fans immediately began to speculate about what connections there might be between the two. 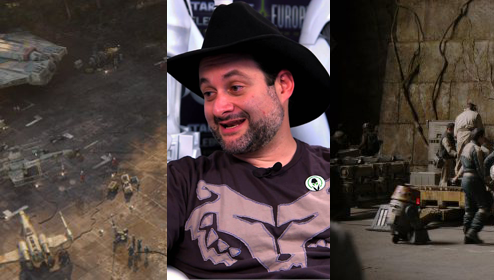 With Rogue One now in theaters, Rebels executive producer Dave Filoni sat down with Entertainment Weekly's Anthony Breznican to discuss some of the connections and share insight on what they might mean for the future. One connection that was actually first revealed in one of the TV spots was that the starship The Ghost, which is flown by our heroes on Rebels, would be appearing in the film. The Ghost makes several blink and you miss it cameos in the final battle and can also be seen parked on Yavin IV when Jyn and Cassian are about to leave for Jedha. But what was The Ghost's role in the battle? Filoni is already working on what that story might be, tellin EW, ""I already have some theories about the story behind it. I can imagine doing that entire [Scarif] battle from their point of view, whoever is on the Ghost at that point." While Chopper was the only character to actually make a cameo, another hero from Rebels is referred to in dialogue. Following Jyn's failed attempt to convince the council to invade Scarif to go after the Death Star plans, an announcement can be heard in the Rebel base calling for "General Syndulla". Filoni confirms that this is indeed a reference to Hera Syndulla (voiced by Vanessa Marshall on the show) and not her father Cham. The idea for the announcement Sound Editor Matt Wood. When Star Wars Rebels returns on January 7th, it will feature a Rogue One guest star with Forest Whitaker reprising his role as Saw Gerrera on the series. I'm glad they've connected these two, it gives a more "real" sense to the star wars universe as a whole. However knowing about all the little Rebels easter eggs in Rogue One now, why did Gareth and Filoni say very adamantly that the two would not cross in any way...misdirection is one thing, but it seems silly at this point now the movie is out.